Your guide to peace and connection at home. 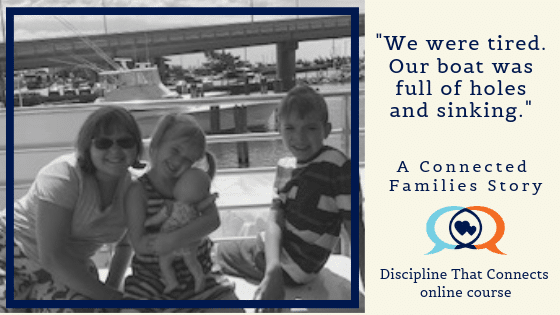 In 2015 Melissa* took the Discipline That Connects With Your Child’s Heart online course. Read the following story to hear how God’s grace-filled transformation helped her find peace for her family – especially in regards to her then 5-year-old son who struggled with aggressive outbursts. Our family was a mess. A complete mess. There was no respect, there was no deep connections or relationships. I was parenting out of sheer will and just trying to get through the day. The Bible verse “My people perish for lack of vision,” certainly applied to us. We were tired. Our boat was full of holes and sinking. My son was the one who suffered the most. He is a lovely, energetic, 9-year-old boy, with SPD and apraxia. Needless to say, his lack of communication frustrated him frequently. I dealt with screaming, hitting, kicking, biting, and he was NOT thriving. I was at a loss. I found Discipline That Connects on accident when a friend shared about it in their Facebook status. That post led to a life change, and I could not be more thankful. I took the Discipline That Connects online course and was blown away. This is the way I want to parent! This is the connection I was looking for. This is the love and warmth I want my kids to experience. I learned so much about our son. I learned how to help him feel loved and secure. I struggled through the “responsibility” aspect of the training, but I was never alone. My son went from a frustrated, lonely boy who bounced off of everything in sight, to a smiling, cuddling, safe boy. For that I will ever be grateful. He has learned that he is loved, he is secure, and he no longer fights over every little thing. He has learned to take a breath. To share his feelings. His hitting is almost nonexistent. He can play with his siblings now without everything ending in screaming. I can help him work through his feelings – his ever so big feelings. I can see his heart now. I can see the caring, hardworking little boy and not the angry frustrated boy. I cannot thank the Connected Families staff enough. This is truly the work of God. Our ship is no longer sinking, we are not going down in flames. We are patching holes together and learning to stay afloat! I am becoming the parent I want to be and I’m raising children who know they are loved. And that is priceless. Your family can have the same transformation as Melissa’s family! Register today. If you aren’t 100 percent satisfied you can request a full refund within 30 days of purchase. ← What if Alexa recorded my every parenting move? Receive a weekly grace-filled email to challenge and encourage you in your parenting journey. 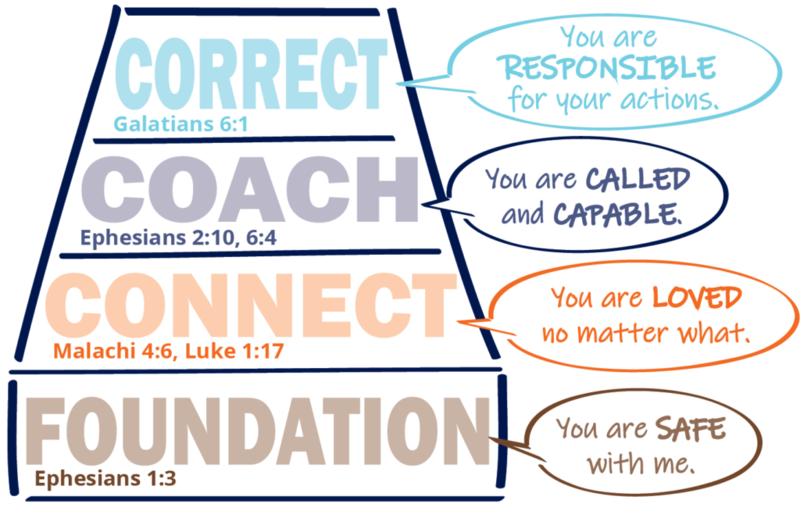 The Connected Families framework is summed up in this powerful pyramid. When parenting happens from the bottom to the top, it changes even the most challenging family dynamics. Jim & Lynne Jackson began Connected Families in 2002, and with their growing team, they are committed to bringing you content that will challenge, encourage, and equip you to be the thoughtful and confident parent you long to be.